MDC president Nelson Chamisa has pledged to review the hero status of the late nationalist Ndabaningi Sithole who was buried at his farm in Mount Selinda, if he wins the forthcoming general elections. 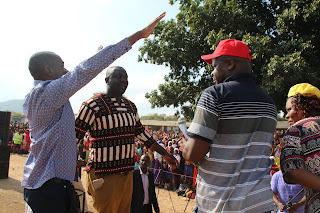 Chamisa, who will contest this year’s presidential elections on the MDC Alliance ticket, told a bumper crowd at Kondo Business Centre in Chipinge at the weekend that his government will grant Sithole national hero status post-humously. “We want to thank Sithole, the pioneer of our struggle for independence who was unfortunately denied national hero honour by the cruel Zanu PF but I want to promise you that as soon as I am inaugurated as president, I will order that he be reburied at the National Heroes Acre,” Chamisa said. “They sidelined Sithole attempting to rewrite history saying all sorts of bad things about him but this is the kind of behaviour that cast bad spells on the country. “That is why the country is always befallen by misfortune including perennial droughts and diamonds vanishing without trace. “It is all because God is not happy with our ways. “The last time I came here in the company of our late president Morgan Tsvangirai, we went there to Mount Selinda to pay our respects because we realised that he is our hero. “We thank him for his vision of a free Zimbabwe although he was denied the fruits of independence,” he said. One of the pioneers of Zimbabwe’s liberation struggle, Sithole died in the United States in December 2000 at the age of 80 after a long battle with high blood pressure, but was denied hero’s status. Sithole spearheaded Zimbabwe’s struggle for independence in the early 1960s and until the late 1970s when he was ousted, forcing him to form Zanu Ndonga. Critics say the conferment of the hero’s status is biased against those outside Zanu PF, regardless of their contributions to the nation. Currently, there is heated debate on the granting of hero or heroine status to Zimbabweans. Presently, the Zanu PF politburo has the sole responsibility of deciding on who should be buried at the National Heroes Acre. Chamisa also bemoaned the lack of development in Chipinge, accusing government of marginalising it along with Binga district. “The sad thing is that it is areas such as Chipinge that has produced some of the individuals that the country is proud of today. “Some of them, including the likes of former Reserve Bank of Zimbabwe governor Kembo Moyana who served the country diligently and never stole anything from you. “The likes of Lovemore Madhuku, some of the best legal brains we have, the Zamchiyas (Philani) yet government does not recognise what they have done and continue to do. “The act of heroism is both historical and factual. It just cannot simply be earned by future occurrences or happenings.